This 1910 Crocker has an unusual filling system! It is a #3 pneumatic-filler in smooth BHR. The filling mechanism was designed for the user to put the bottom of the barrel into their mouth and blow so the air pressure collapsed the bladder. In later years they provided a rubber syringe to use instead of your mouth. Founded 1902 in Boston, made blow-fillers and a locking lever-filled located at the end of the barrel (now commonly called the “Hatchet-filler). The barrel with two gold-filled bands. Signed Crocker extra-fine, flexible nib. New-old-stock. Mint. Item #62 in Catalog #84. 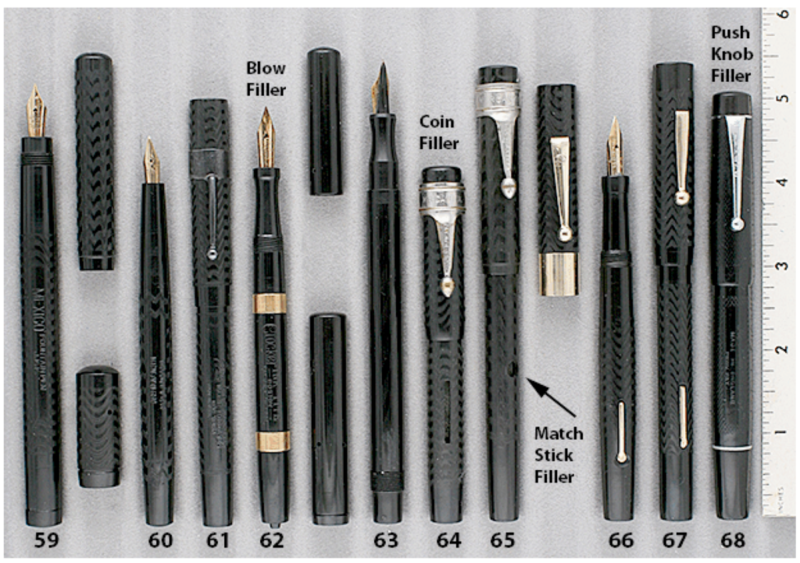 This entry was posted in Vintage Pen, Vintage Pens and tagged Catalog, Catalogs, Crocker, Extraordinary Pens, Fountain Pens, Go Pens, GoPens, Handwriting, Handwritten, Vintage Fountain Pen, Vintage Fountain Pens, Vintage Pens. Bookmark the permalink. Follow any comments here with the RSS feed for this post. Post a comment or leave a trackback: Trackback URL.